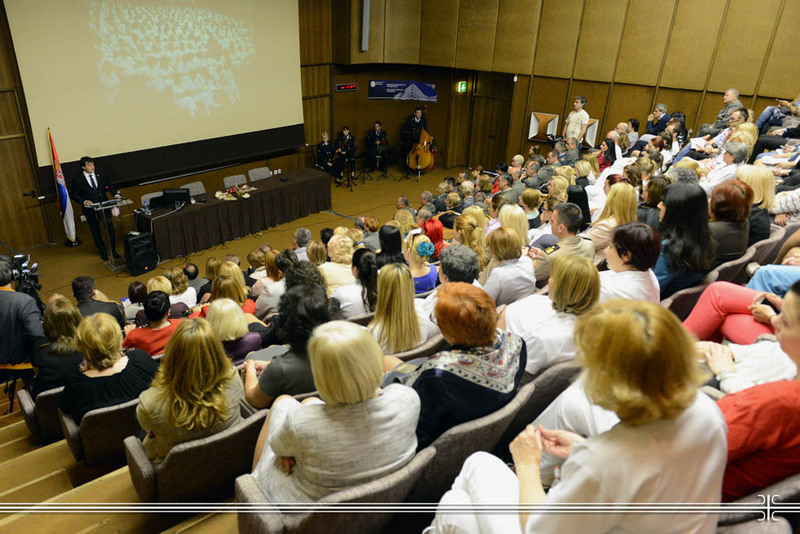 The International Nurses Day was marked at the ceremony in the amphitheater of the Military Medical Academy. On that occasion, Defence Minister Bratislav Gasic presented the traditional recognition award to a nurse of the year at the MMA, which this year Dragana Lazarevic received,the head nurse of the II Department of General Surgery Clinic. Congratulating the holiday, Minister Gasic pointed out that during the official meetings with his counterparts from around the world, one of the most important issues was always the military medical cooperation, and the fact that the MMA is among the top five world institutions of this kind. - It is to your credit, your achievement, which has been creating for years continuously in the MMA - the Minister Gasic emphasized, noting that nurses will get a significant boost with 40 newly employed colleagues. Aware of the seriousness of their job and the lack of staff, the Defence Minister said that the plan is to have vacancies opening for 100 nurses in the institution. Gasic has also announced that a task that needs to be accomplished next year is an improvement of the status of all members of the defense system, and therefore of the healthcare providers. According to the Acting Head of the Military Medical Academy Colonel Prof. Dr. Zoran Segrt, MMA has always had a quality nursing staff committed to their daily work, both in peace and in emergency circumstances, and one of the reasons is the systematic and organized investment in the development of the profession. - One of our priorities is to invest in the education of nurses and technicians. The developed international cooperation that we have, especially under the auspices of the European networks of medical schools, significantly increases the quality of education - said Colonel Segrt, recalling that the former High School for Nursing had given excellent results in the past and that in such direction the way for future generation of nurses is paved out, striving towards the creation of such schools within the MMA’s Medical Faculty. Colonel Segrt signified that he is aware of difficulty of the nurses’ job, they are the first and last contact with the patient, and that without them, the knowledge and skills that doctors have and possibilities of technical equipment would not be able to come to the fore. MMA’s Head Nurse Verica Milovanovic pointed to the nurses’ and technicians’ contribution to treatment and improvement of the patients health they have been providing in their daily work for years to the institution, adding that although technology development in medicine is in progress, warm human touch and word of encouragement cannot be replaced by any device. The International Nurses Day is celebrated to commemorate the birthday of Florence Nightingale, who had given a strong contribution in the formation of modern professional nursing.